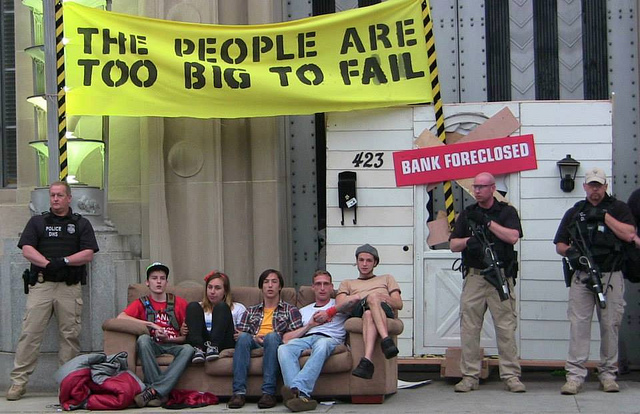 Text @occupyhomes to 23559 or click here to sign up for eviction alerts. 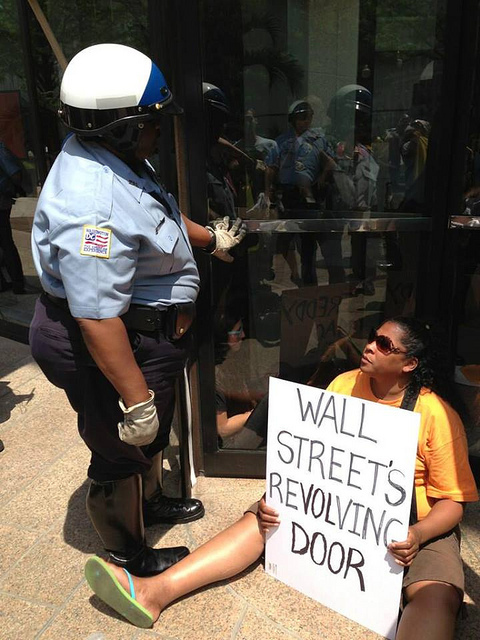 We’re ready to hold Wall Street accountable on a bigger scale than ever before. City by city, we’re going to force banks to the table to prevent foreclosures, turn vacant homes into community-controlled affordable housing, and reclaim our communities’ wealth. Minneapolis is next! This is an Eviction Free Zone. We shall NOT be moved! Thanks to all your petition signatures, phone calls, and marching on Wells Fargo, I am finally at a place where the girls and I are able to move into a new apartment! The abandoned Wells Fargo home we reclaimed became the stability I desperately needed to get back on my feet. People who haven’t gone through it don’t realize the important things you lose when you become homeless. It’s way more than stuff. It’s your sense of self, your identity, your neighborhood, your reputation, your community, the story you tell people about yourself, and in my case it was the time I had with my girls. The girls, the community and I at a housewarming barbecue in February. This house gave me an immediate neighborhood; incredibly supportive neighbors who gladly welcomed me, my family and my movement; and a chance to make something good happen. Ripping up carpet, cleaning up all the garbage and filth, painting a dingy wall pristine white–these are the kinds of things that knit you back into a life. I began to see how my ravaged life could have something good in it too. At first you feel alone when you’re homeless, like it’s only happening to you. But that began to change as I met more people who were struggling and who cared about my struggle. The house became bigger than me. Through community support and positive media coverage, we changed the narrative about what homelessness means–and raised awareness that there are 5 vacant homes for every homeless person in this country. 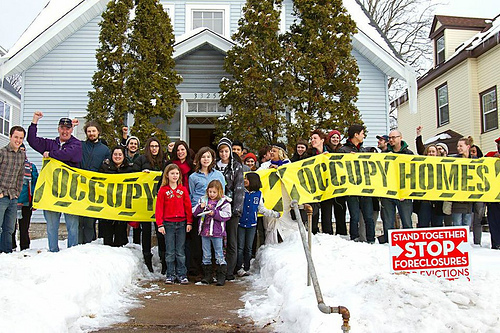 As Wells Fargo sent their management company to illegally board up the home four times, we only grew stronger as hundreds of people came through the house to give a part of their life to it to keep the movement going to end homelessness. 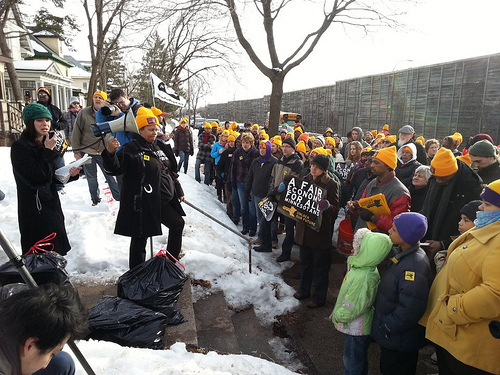 Speaking before a march on Wells Fargo this winter. We marched the garbage they’d left behind right back to the bank. Now that I’m on my feet again, I want to give that opportunity to more people. So I’m leaving the house in capable hands. Josh and Antoine, who were experiencing housing instability, have been here from the beginning, restoring and protecting what Wells Fargo has tried to board up. They are leading the fight demanding Wells Fargo turn this home over to a nonprofit for use as long-term affordable housing. It’s so important for people experiencing homelessness to not be thrown away, to have a place where they’re invited to contribute and be part of a community in a way they haven’t been. 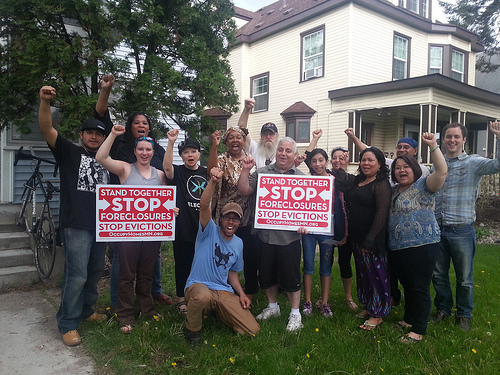 These courageous people have all fought their own housing injustices–including Antoine, center. Thank you for being part of the movement that helped me reclaim the story of my life. I’ve really appreciated seeing all of your signatures and would love to meet you. If you’re in the Twin Cities, please come to our meetings Saturdays at noon at the reclaimed home, 3325 2nd Ave S in Minneapolis. You can share this petition with your friends through email, Facebook, Twitter, etc. to spread the word. Finally, your donations will further this work to make it possible for more homeless families to get on their feet in a way that also empowers them and brings our communities together. This wouldn’t be possible without you. Thank you so much for all your support. When my baby girl was born, I realized that she would grow and need space to play and would not have that at our apartment. I sat to talk with my wife and suggested that it would be better to buy a home, and she was thrilled by this idea. It was then that we decided to buy a house. We were shown a home in which we are currently living, the neighbors are very friendly, we are very satisfied living here but now Wells Fargo wants to throw us out. After meeting so many courageous people during the week of action at the Department of Justice, my head is still reeling from what a wonderful and amazing experience it really was. 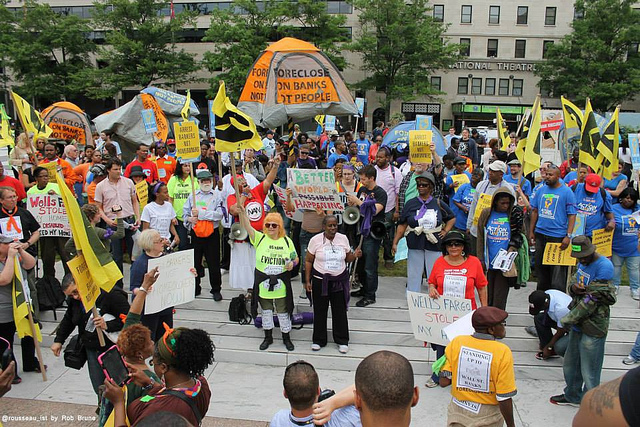 I went to D.C. with other foreclosed homeowners from around the country to protest the Department of Justice, which has refused to prosecute any bankers for the crimes they’ve committed that crashed the economy and continue kicking people like me out of our homes. Attorney General Eric Holder, who used to work for a law firm that represents Wall Street, has said that the banks are “too big to jail.” As a mom, I know that without consequences, there’s no change in behavior. I fell into foreclosure because U.S. Bank told me to stop paying my loan so I could get a modification. Then, instead of modifying my loan, they sent me the wrong paperwork and foreclosed on me. If I did something like that, I would go to jail. Why don’t the bankers? When I arrived in DC, I met people from around the country at the training facility and got to know them and their stories. Although they were from different places in the country, our stories were all so familiar. After two days of training exercises led by some fun people, some I knew, some I just met, I was ready for Monday morning/afternoon’s action. Monday morning after breakfast and a few more training exercises, I had my first interview with a local TV station, along with two other women, then we left for Freedom Plaza where we would march to the Department of Justice. After listening to speeches from some phenomenal women about why we were here and what we hoped to accomplish, we assembled at the corner, and proceeded to march to the Department of Justice! We chanted and I took in every minute of that time looking to the left, the right, front and back of me in awe. It was amazing to see how strong this was going to be. After getting to the Department of Justice I read a portion of a letter to Eric Holder explaining the urgency for him to spend a few minutes hearing directly from some of the millions of Americans whose lives, communities, and economic futures have been devastated by the Wall Street executives whose crimes he has declined to prosecute. When there was no response to our letter, the police retreated back into the building, and we celebrated and embraced that space. We the people did that! We broke into 3 groups and marched to the street where we protested for the next several hours, together. Word got to us that people were now being arrested in front of the building. We went back to be with our brothers and sisters. When we turned the corner, we found people being tased. 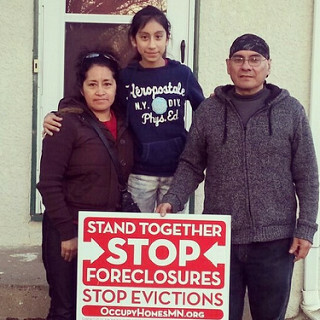 Unarmed, peaceful homeowners who were standing their ground were tased and taken to jail. The feeling of victory went away for a brief moment, and was replaced by fear. Why were they doing this to us?? Once the first group was arrested we were allowed to stay there for the rest of the day/night. 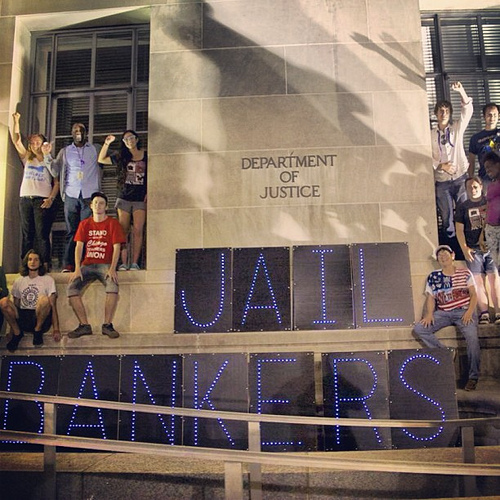 Some of us camped on the lawn of the Department of Justice. The feeling of victory and pride came back, and although I didn’t get more than an hour of sleep it was the best night under the moon I have had in a long time.